I can agree that slander revile me, but mess with my family and especially my mother who is not in good health, no. Thanks to Jaicrab for everything you have helped and given me strength to keep going. Thanks Alejandro for having such patience and test every day and admire you since you started many years ago, I wish you the best of heart. 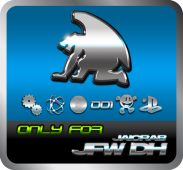 Thanks to my brother DanteHades all dh JFW designs and for being such a good brother. Thanks to blipi, mater, tuhta, consoledev, and more devs to create what will be the custom for the community. Thanks to Luca for giving the post of admin ps3pirata. Thanks to the testers of JFW dh that I take very good friends and colleagues. And of course thanks to all the community of demons, never cambiéis and above all enjoy what you do. Alejandro if I read it, just ask a favor and which to me would have liked to take .. and it was completed JFW see dh for all demons and people of good faith that it deserved. no more I say goodbye, many thanks to all who put your trust in me ... I will never forget ... and I applaud you can hate, until forever.